Bias in the workplace: How Can AI Help To Prevent It? If someone were to ask you to imagine what a software engineer looks like, what would you picture? How about a doctor or investment broker? Likely, you imagined each person in a similar manner, be it the same gender or ethnicity. If so, you’re not alone—bias, whether conscious or unconscious is something everyone possesses. Unconscious bias, also known as implicit bias, can be hard to recognize because it’s deeply ingrained in all of us from a very early age but that doesn’t mean it’s impossible to identify and correct. It’s imperative to try to remove bias from the workplace from both an ethical and business perspective. Research from McKinsey & Company reveals that businesses with highly diverse gender and racial diversity were 21% and 33% (respectively) more “likely to experience above-average profitability than companies” that were less diverse. This begs the question, what can we do if implicit bias is hard to identify and so deeply rooted in our lives? A potential solution to this problem may just be found in technology, specifically advances in artificial intelligence (AI) and machine learning capabilities. 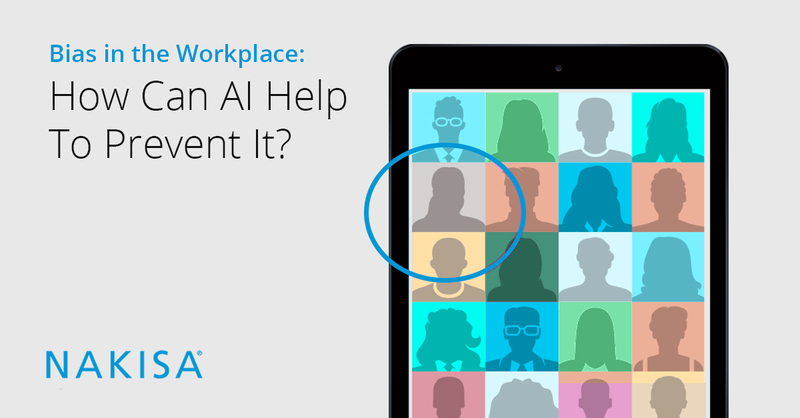 Though still in early stages of testing, there are numerous companies harnessing AI and machine learning algorithms to help eradicate bias in the talent management lifecycle. For example, Atipica, a tech company founded in 2015 uses a company’s own data to highlight patterns that occur during recruiting and hiring. Atipica’s platform integrates with a company’s applicant tracking system and identifies skills, experiences, and demographics to reveal patterns, such as hiring more people of one ethnicity or gender than others. The platform also surfaces qualified, yet underrepresented applicants. Nakisia’s own organizational design solution Hanelly offers HR leaders an in-depth look at the company’s employees. Hanelly fully integrates with native HCM platforms and provides complete analytics on the integrated data through the reporting dashboard giving immediate access to easily view the demographics of an organization. If HR leaders choose to view current and historical data for their employees, then patterns can be immediately identified. Using this information, key decision makers can decide to implement any D&I programs, and utilize Hanelly to assist with monitoring and easy reporting of the data as well as metrics on the success of these programs. Recruiting software company, Entelo, is also highly invested in ensuring its platform keeps HR professionals unbiased by using AI to highlight candidate skills and experience rather than relying solely on a resume. Entelo’s algorithm allows HR to filter through qualified candidates from underrepresented groups based on disability status, ethnicity, gender, and more. Additionally, the platform has the capacity to identify where recruiters are succeeding and/or falling short in diversity sourcing, which can be used for training teams in D&I talent management. Though AI may be a missing piece of the D&I puzzle, it isn’t the only solution. Experts caution that AI is only as unbiased as the engineers creating it. Addressing bias in the workplace requires a solid culture of inclusion modeled from the top down. Throwing AI into the mix without addressing any cultural problems won’t solve a problem as deep rooted as implicit bias. Do you currently utilize any technology to improve D&I and reduce bias in your organization?